The MPT-4C metering pulse totalizer is designed to provide the totalized pulse values from four 2-Wire (Form A) or 3-Wire (Form C) input pulse sources. Two 2-Wire Form A or 3-wire Form C (K, Y, & Z) outputs from isolated, solid state, dry contact relays are provided. Inputs are signed + or – to provide additive and subtractive capability. The MPT-4C’s output module may be operated in 1-channel or 2-channel mode. In 1-channel mode, the MPT-4C operates with a single KYZ output channel. In 2-channel mode, the MPT-4C operates with two independent KY output channels, each having a unique output value. In both configurations, there are two physical outputs on each channel, eeliminating the need for an additional “splitting” or pulse duplicating relay. The MPT-4C incorporates a peak demand software module that tracks the average kW demand in any interval and captures the peak demand for later reading in non-volatile memory. A seperate demand reset allows for resetting of the peak demand module only. An EOI signal is provided by one of the four meters to signal the end of each interval and the start of the next. Typical include interfaces between utility metering devices and customer-owned energy control systems, demand billing applications, and supervisory control systems (SCADA) interfaces. The pulse signal inputs to the MPT-4C is by four sets of “Y” & “Z” leads with a common “K” lead. 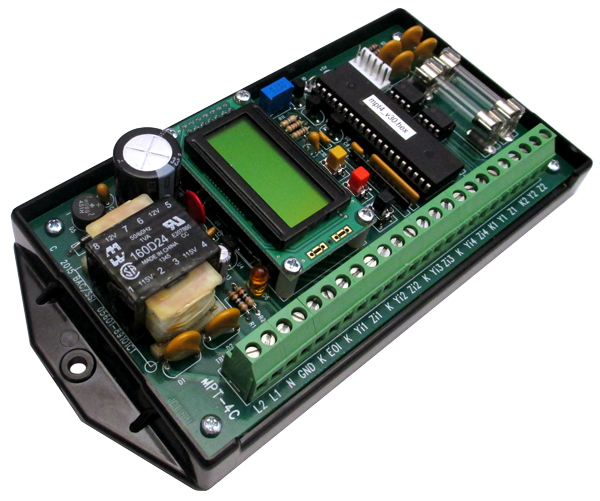 The MPT-4C provides a “wetting” voltage of +13VDC to the four pulse sending units, normally electric meters. Each of the MPT-4C’s inputs may be assigned a four digitpulse value which can be set from 0001 to 9999. The output value setting is a six digit number from 000001 to 999999. Both the input and output values may be field set without the use of any external devices. All settings are saved in non-volatile memory. In addition, the minimum time between output pulses may be set in 10 milliseconds increments between 20 milliseconds and 1000 milliseconds. An LCD display contained within the unit displays the status of each of the inputs and the output as a Y or Z when not being used in the setting of the pulse multiplier values. Using software debouncing technique, all inputs are first checked for the correct sequence and then a minimal time of contact closure duration to assure a maximum noise rejection. The “K” lead of the MPT-4C’s outputs are fused to prevent damage to the relay under almost any conditions a user might cause such as excessive current, incorrect wiring, etc. The MPT-4C has built-in MOV transient protection for the solid state relay contacts which eliminates the need for external or off-the-board transient suppressors. All component parts of the MPT-4C, which have power applied to them with the exception of the input/output terminal strip, are enclosed in a polycarbonate cover for maximum protection. The mounting base plate is also made of polycarbonate and offers excellent electrical insulation. Four 2-wire Form A or 3-wire Form C inputs. “K” terminal are common return from meter; “Y” and “Z” terminals are pulled-up to a sense voltage of +13 VDC. Compatible with dry-contact mechanical, electro-mechanical or semiconductor outputs (i.e. open connector transistor or MOSFET transistor). Two sets of Form C (K, Y, & Z) dry contacts or two independent Form A channels with two outputs each for energy pulses rated at 100mA at 120VAC/ VDC. Factory fused at 1/10 Amp with 3AG fuses. 800mW maximum contact power.